Let’s make it clear at this point that I’ve not discovered the techniques to conquer SPLinq. The credit goes to these quys who have exposed the information to the web: accessing data cross site collections with SPLinq, making Linq to SharePoint work for Anonymous users, Linq to SharePoint presentation among others. Having given credits to those who deserve it, I have to also mention that I’m not too keen on the techniques and tricks. Clever they still are and I believe the only solutions to the problems. To go with what we have was my starting point this time to make some kind of a POC. The idea of the above clip is to go around the condition in Microsoft.SharePoint.Linq.Provider.SPServerDataConnection by setting current httpcontext null in the constructor and setting it back to what it was in the disposer. The DataContext is also exposed via elevated privileges when used in anonymous context. 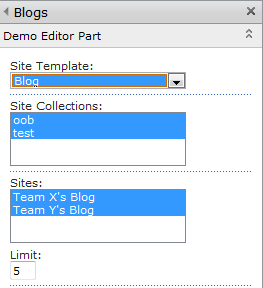 Second phase was to create the data access model with SPMetal similarly to what was described in my previous post and to extend it with custom mapping to have one more field in the queried SharePoint blog posts, the publication level of the post item. There is a clear problem in the clip above: running with elevated privileges. Although the query only gets published items, how can we be sure the queried sites allow anonymous access – that would be another thing to consider. My first intention was only to get the DataContext with elevated privileges but when testing, I noticed I couldn’t get the anonymous scenario to work with Blog-sites in another site collection exposed to anonymous access (403 Forbidden) whereas there were no problems retrieving posts from the current site collection – that is why the query is also executed with elevated privileges in anonymous use, not only the creation of the BlogDataContext via ContextSwitch.GetContext. Please tell me, if you find the reason for this. And yes, it works – the web part lists blog posts from two different site collections even in anonymous use and the web part’s custom properties also work nicely with the scenario. 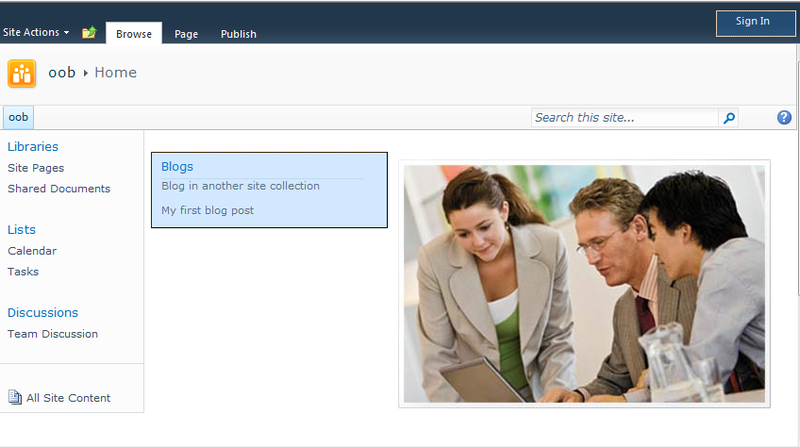 Am I happy to have accomplished this and would I use the solution to show information of blog posts in some public SharePoint site. Absolutely not. We have our built in content query web part – let’s stick to that. I might consider using the solution to overcome the site collection limitation if absolutely needed in a scenario where anonymous use is prohibited but I think I would feel a little nauseous. I still haven’t overcome the explanations – or lack of them – given for the SPLinq’s scope being the current site collection. It can’t be that site colletcion should be the scope of custom queries. We’ve had our CrossListQueryCaches, SPSiteDataQueries, the search API along for some time now and with these libraries and techniques it hasn’t been a hard task to query data from another site collection. Might it have something to do with the fact that the SPLinq is a two way interface. You can also submit and delete data to and from lists with it and if some vulnerability would be exposed if there wasn’t the oddity – and oddity it is – in SPServerDataConnection’s constructor which forces the use of SPContext.Current.Site in SharePoint context, I could not say. ariana grande weight loss before and after. Gymms annd recreeational fitness centers have gained a lot of popularity over the last twenty years. iss an option provided by the recipient to unsubscribe ftom the mailing list. may or may noot need certain informatkon you havfe to offer. un jus de fruits ou de legumes ou encore un veloute. (ROI). Then, once published, promote them through your social media outlets to widen your audience. These may either be caused by the process of baking or the quality of breadmaker itself. goes in your box and out the door frees up space in your home and helps out a good cause. it on the line to keep in the loop when a callback never occurs. on blogs I stumbleupon everyday. It’s always helpful to read through articles from other authors and use a little something from their web sites. just take a photo of each one as soon as you receive them. diamond portion with the ring. Μy brother гecommended I might like this web site. He was entirepy right. This submit truly made my day. We meet of mice and men pdf her for spare, uncluttered panels. but with an engaging showman. Simply wish to say your article is as surprising. The clarity for your submit is just excellent and that i can think you’re a professional on this subject. Laser Therapy For Acne Scars: Laser Rapid acne treatments, Jannie, That Work Scars Honey Lemon Treatment. posts. Keep up the great work! You already know, lots of individuals are searching around for this information, you could help them greatly. helo, i’m noob, what this it ?